- This demo member account will be reset everyday. And any content that is offensive will be deleted. You will not be able to change the password for this member but the functionality works fine in the full version. Integrated theme pages to keep your site not looking like WP. Opportunity to gather more user data up front. Sign Up is equip with re-Captcha spam option. Members can keep track of where they are in the site’s rankings. 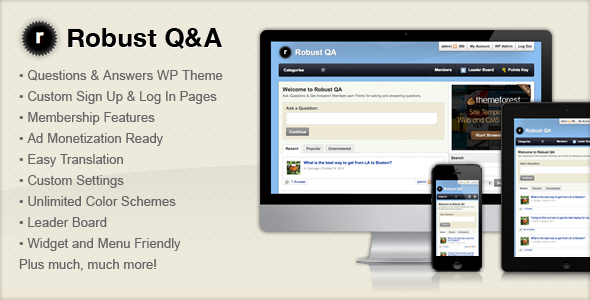 Manage all your Robust Q&A options from 1 easy-to-use admin page. View, Promote and Remove Experts Status of any member of the site. You can enter an image url to customize your site’s logo. This theme also comes out of the box with a styled logo design. Want to showcase your site in action? Contact Us and if we feel that the site qualifies, we will feature it here! Not all sites will qualify. Supporting buyers is our number one concern and we do our best to get back to you with timely responses and honest feedback. Please give us at least 24hrs to respond to your requests. 06-16-2016 – Minor Bug – functions.php – wp_mail() function was not sending mail for actions. Changed to use native mail() send function. 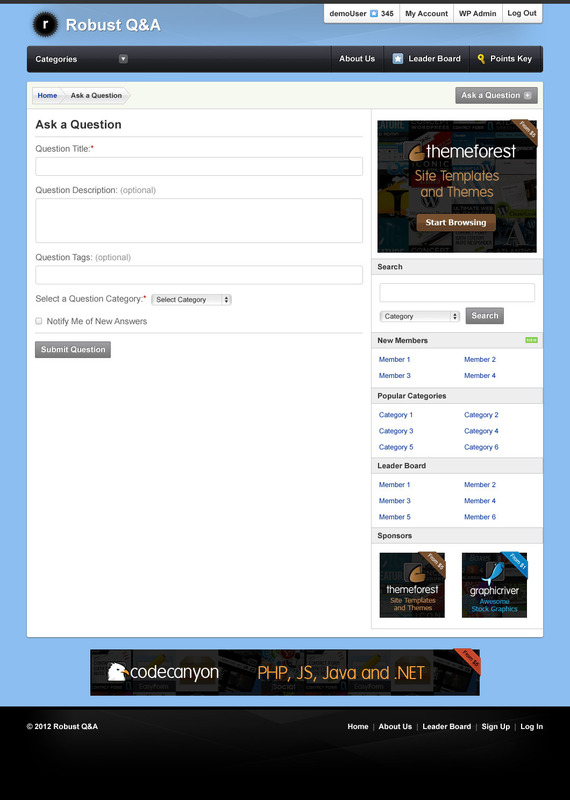 03-01-2015 – New Feature – functions.php – Added the ablity for admin users that can access wp-admin to view/edit any Answer/Comment Source URLs on each edit comment page. Admins can also see all of the source urls that are set from from view all comments list in wp-admin. 11-23-2014 – Minor Bug – comments.php – usernames with two spaces were producing bad urls. Changed to use nicename value in user array. 02-06-2014 – Minor Bug – leader-board.php – two page varibles items were not using the translated permalink values. 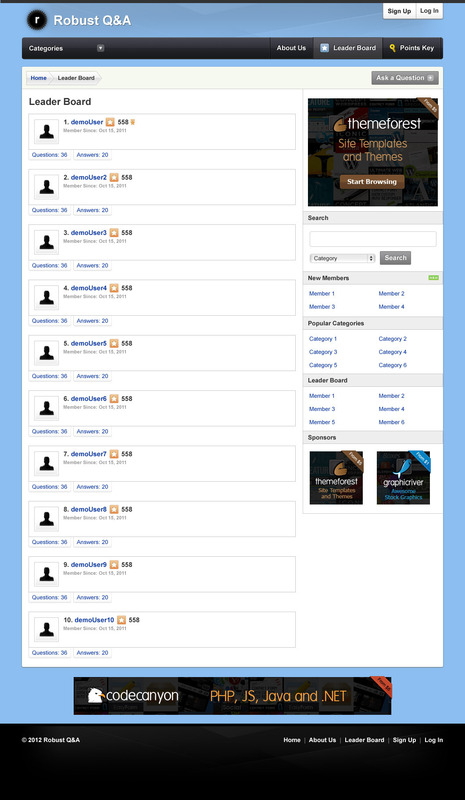 12-30-2013 – Minor Bug – search.php – fixed a bug to define the class varible for the All Categories value. 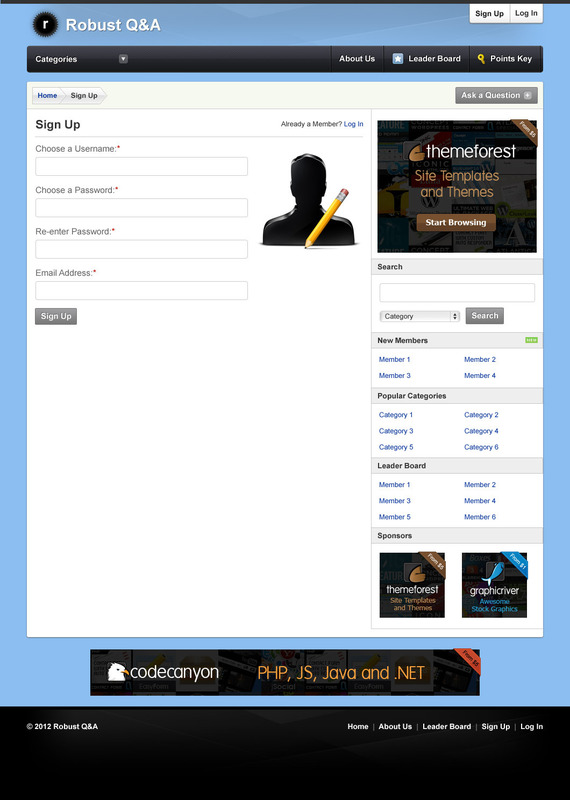 11-15-2013 – Feature Enhancement – Signup forms now have the power of reCaptcha. 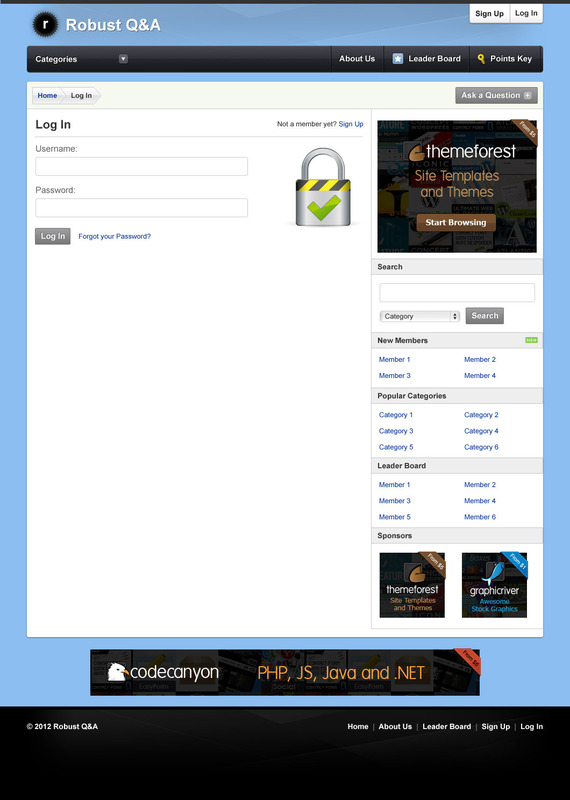 Admin theme items have been added to enable and capture the reCaptcha keys. 09-14-2013 – Minor Bug – functions.php, archive.php – fixed a bug that in 3.6+ wasnt allowing questions to give points to existing users. Also had a very minor defect in archive.php that had a missing ”>” for the View more Tags Button. 04-17-2013 – Security Bugs – functions.php – fixed security bugs that were allowing actions to be executed from external sources. 02-21-2013 – Minor Bugs – functions.php, single.php, search.php, reported-content.php, questions.php, my-account.php, leader-board.php, header.php, comments.php, archive.php, index.php – fixed the way that urls to user profile was working for users that have spaces in their username. Synced the way that this layout was being treated theme wide. A few items that were not translated are now. No new translations though. 02-11-2013 – Minor Bug – functions.php – whitespace bug at end of file was causing hiccups for adding categories in wp-admin. 02-11-2013 – Minor Bug – index.php, searchwidget.php, my-account.php and translations.php – a few translations were not translated. 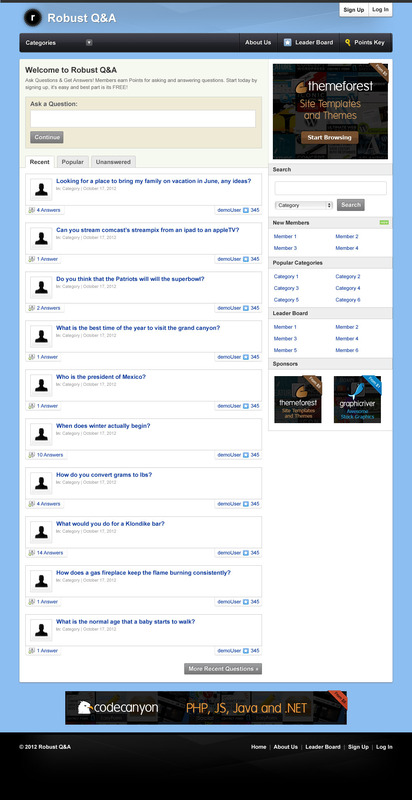 02-10-2013 – Minor Bug – functions.php – fixed a quote bug when posting questions. 02-10-2013 – Minor Bug – comments.php – fixed the way that comments were showing to allow the br tag for new lines. 02-07-2013 – Minor Bug – questions.php – missing an echo statement. 02-01-2013 – Minor Bug – my-account.php – was showing the wrong username on unanswered tab. 01-30-2013 – Minor Bug – index.php – was showing the wrong username on unanswered tab. 01-30-2013 – Officially Launched on Themeforest!